Catching the ball can be quite difficult for a young player who is new to the game of baseball. Most young kids are not very coordinated with their dominant hand, let alone with a glove on their non-dominant hand. It can be quite awkward for them at first. Here are a few tips and drills that I like to use when I’m teaching kids to catch a baseball. Ask your players to point to the part of the glove that they are trying to catch the ball with. You’ll find that many will point to the palm of the glove. Anytime a ball hits the palm of the glove it is going to bounce off and potentially out of the glove. Explain to them that they are trying to catch the ball in the “pocket” or “web” of the glove and show them where that is. Inspect their glove. Is it too stiff for them to close? The younger the player, the less grip strength they are going to have. It is very important that the glove is broke in and has some flexibility so that they can close it. If their glove is broken in, does it have a pocket? Many kids do not understand how to break a glove in so that a pocket is created for the ball. If their glove is stiff or has no pocket, you will want to give them some guidance on how to properly break their glove in. Have them try putting two fingers in the pinky hole. Many experienced players, especially outfielders, put their ring finger and pinky fingers together in the last finger hole in their glove. 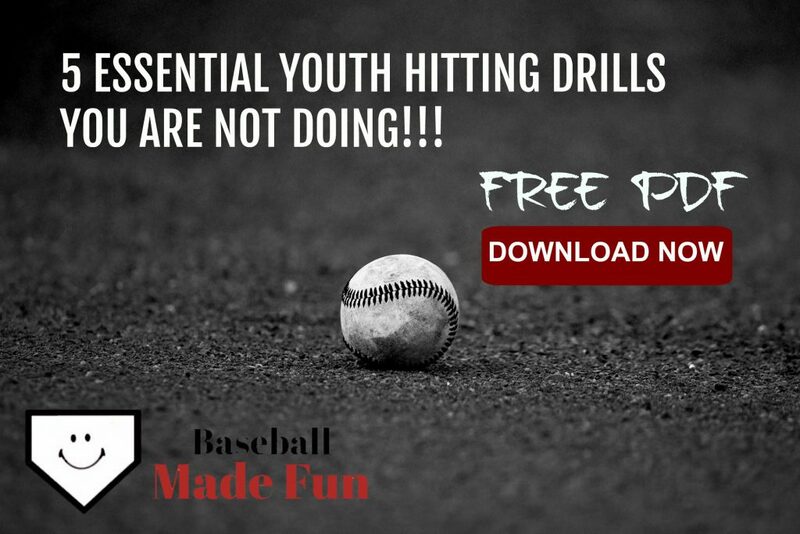 In my experience, most youth players have never heard this tip, and when they try it, it makes it easier for them to close the glove around the baseball. Ideally, every ball we catch in baseball is going to be out away from our body. Catching too close to our body leaves little room for last second adjustments and makes our arms, hands and gloves stiff. Many young kids, however, keep their elbow close to their side while trying to catch, instead of reaching out to get the ball. Help them form a new habit of reaching out for the ball. Teach them to have a ready to receive position. Whenever your team plays catch, always have the player who is going to receive the throw hold his glove out in front of his chest, showing his palm as a target to his throwing partner. While playing catch is beneficial, it is not the most efficient way to teach a kid how to catch the baseball. If you coach young players then you understand that a game of catch is more like a game of “fetch” for beginners. Players don’t get nearly the amount of reps they need to learn to use the glove properly. Focused drill work is a much more efficient means of developing glove skills. The glove hand, which is our non-dominant hand, is much less coordinated than our dominant hand. It takes a lot of work to get comfortable and efficient in our use of the hand for catching. Kids love using other tools to aid in the development of this hand-eye-coordination. Some of my favorite tools to use are frisbees , bean bags , and those tennis ball velcro paddle games . Without a glove on, toss a bean bag or a frisbee back and forth with the player and have him catch it barehanded with only his glove hand. Both tools will force the player to pinch his thumb and fingers together, mimicking what the hand will have to do when catching with a glove. Strap the velcro paddle to a kid’s hand and they are automatically forced to use have their palm open and toward the ball to make the tennis ball stick. This is perfect practice for catching a baseball with a glove on! Once the player begins to improve at catching those objects, move up to barehanded catches with a ball. Use a softer ball when doing these barehanded drills. Baseball sized or smaller Nerf balls and tennis balls work great for this. Progression tip: When the player begins to develop some catching skills, begin to challenge them. One way to challenge them is a rapid fire catching drill. With a bucket of baseballs, stand about 10 feet away from the player. Have them stand in an athletic stance, with their glove up and ready to receive. Begin flipping the balls to the player in a quick progression. Go as quickly as the player can handle. Have them catch, then toss each ball out of the way. After a few, begin to move the flips around on them to challenge them even more. Flip some up high, some low, and some to each side of them. Remember this is supposed to be a quick reaction drill, so keep the balls within arms reach so the player doesn’t have to move out of his athletic stance. Learning to catch the baseball involves more than just developing the glove hand. Players also need to learn to move their feet and go to get the baseball. One way to train players to go get the ball is to use a bigger ball without a glove. You can use a large rubber ball or even a football. Footballs are great not only for learning to catch, but they are also a great tool for teaching throwing mechanics. Have your players take turns running routes and throwing the football to each other. A drill you can use to help players get used to moving after the ball is the short toss reaction drill. This is a very simple drill, but effective in getting kids to go get the ball. Set the drill up with one player standing about 10 feet away facing you in a ready position. You will then flip a ball underhand to a random spot within 2 or 3 steps from your player. Have the player go a few times in a row, and each time flip the ball in a different spot. Make sure you move him left, right, forward and back. Often, instead of going to get the ball, young players will want to move away from the ball from fear of being hit. Check out our post that’s loaded with tips and drills to help players get over being afraid of the ball. It takes time, patience and a lot of reps to develop the ability to catch the baseball. If you are a coach, encourage the player’s parents to work on non-dominant hand-eye-coordination and using the glove at home. They can do drill work with bean bags and frisbees, or simply play catch. 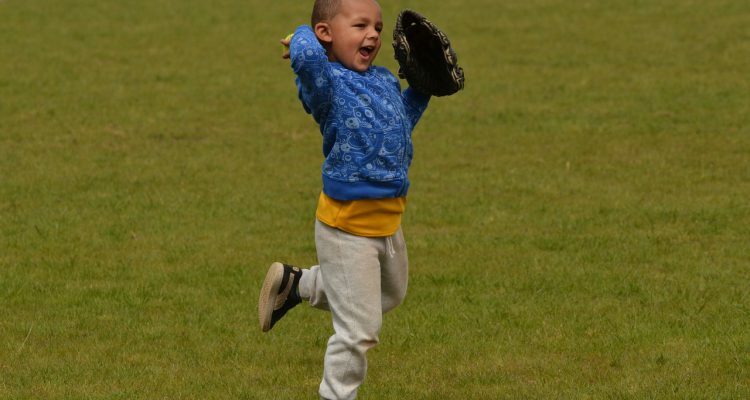 Playing a game of catch regularly at home can do a lot for a kid’s catching ability, but more importantly, it can create memories that last a lifetime. Do you have any tricks or tips that have worked for your players in the past? We want to know. Drop us a comment below! You hit the nail on the head in every point you made on this post. Especially the how hard you are throwing part. I have a buddy who has a son and he plays catch with him in the yard often. He use to play baseball in his younger days and still has the urge to get out on the fired when he can. The problem is his son is like 9 and isn’t all that big. He will throw bullets at the kid and complain at him like its the child’s fault. He needs to see this. I’m going to share it with him. Thank you for this you may change his ways. Great point James! Throwing hard at kids who are just learning to catch may increase their fear of the ball. It’s best to be patient and start slow and soft with your throws. If he still wants to throw hard, it may be a good idea to go to a softer ball. Softer balls can help take away that fear of getting hit, and help the player focus on the task at hand. Thanks for sharing! I really found your website informative. A true passion for baseball comes through. I am glad to have found your page as my children just recently found their Dad;s glove (he played as a child) and have shown a lot of interest. The tips on how to get them to start are great we wouldn’t of thought of that. I am just curious how long does it take kids to actually just get used to the feeling of the glove on the hand? I realise catching with it builds over time but I am interested in just the feel? Thanks Laura! I’m very glad that you find my site informative, and so happy to hear that your kids are showing interest in the game. I don’t think it will take much time at all to get used to the feeling. Like you said, catching with it will take some time, but if the glove is the proper size for them they should get used to the feeling quickly. Just make sure that it fits their hands well, they can close it, and that it is not too heavy for them. Thanks for stopping by the site, and remember to come back for more tips as your kids begin to pick the game up! Great tips on learning to catch a baseball! It’s true, a lot of people neglect to remember that attempts to use the non dominant hand can be very difficult for beginners. Especially when there is a glove on that hand that they are not used to! Excellent idea to try with a bean bag and frisbee first to train muscle memory. Thanks for the comment Jason. Yes, I feel like catching with a glove on is sort of like riding a bike. Takes a lot of work up front, you can get some bumps and bruises along the way, but once you’ve got it, you’ve got it! I completely underestimated how difficult it could be for a child to confidently catch a baseball. My son is pretty coordinated and is a very good athlete, but it took longer than I thought. In our case, it was more about confidence and I’m sure that is probably one of the top roadbocks to learning how to catch. Using a slightly bigger glove also helped. You have to be really patient and practice various drills. Once we practiced regularly, my son advanced quickly. It can be frustrating for parents, but be careful to just throw it up and say “catch it!”. It isn’t as easy as you might think at first! That’s a great point Eric! Personally, I cannot remember the time before I learned to catch a baseball. So I think we as adults can take it for granted that it is an easy thing to do. I suppose it is like learning to ride a bike without training wheels. We taught my daughter how to do that last summer. Before we started, I didn’t understand how much effort and practice it was going take. It took her a few weeks of falls and frustration, but as soon as she got it for the first time, she was off! Baseball or football sports a goalkeeper must know this hacking tips and ticks. I gain a lot of knowledge from this awesome blog. thanks keep it up. Thanks for the encouragement! I really appreciate your readership. I find it cool when you said that a person can train a child to catch a baseball better by letting him play with frisbees, bean bags, and tennis ball velcro paddle games. My suggestion when it comes to rewarding them with their efforts is to have a trading pin made by a local shop. Doing this will help them remember their achievements while playing this sport too. Thanks for the comment, Yoshiko. Kids love games, and rewards! Trading pins are a fantastic idea.